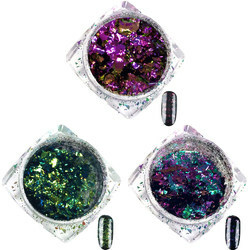 Gorgeous Night Sky Effect - The Starlight Trio is a collection of Artisan Chameleon Nail Art Chameleon Pigment Flakes that create a gorgeous night sky effect over the nail. Color-Shifting Flakes: These color-shifting chameleon flakes transform under the light adding tone and dimension to any nail. Dazzling, Iridescent Looks: The results are dazzling iridescent looks that are perfect for parties, night outs, and more. Don't forget to purchase the Sponge Applicator for fast, easy results.